I made the Mimosa Jello Shots for the New Year’s Eve party I hosted and was surprised how much of a hit these were. I saw this recipe on Pinterest but decided to put my own twist on it and use Orange flavored gelatin. I will admit I did not get those perfectly cut squares that they show in their photo, instead I suggest using the clear plastic shots glasses for serving. Combine gelatin and boiling water in a bowl. Stirring until the gelatin is completely dissolved. Let it sit and come to room temperature. Slowly pour in the chilled champagne. Pour into clear shot glasses until they are about 3/4 filled and set in refrigerator to chill, about 4 hours. 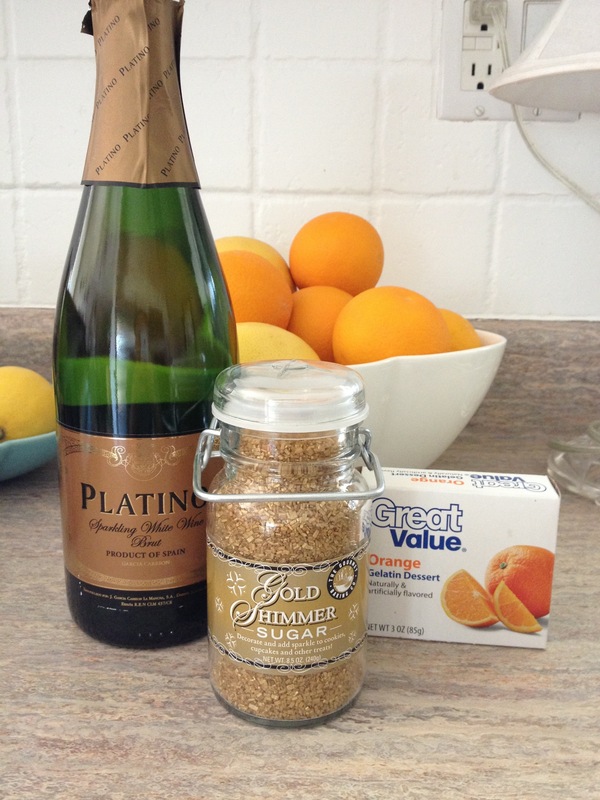 Sprinkle with shimmer sugar right before serving. Note, that the sugar dissolves quickly once on the jello. Enjoying reliving the college days in a more grown up style. My best friend since 3rd grade is getting married in April and I have the absolute pleasure of being her maid of honor. We are going to Austin, TX for the bachelorette party and I couldn’t be more excited. First order of business in planning the bachelorette weekend is the invitations. I wanted to do something personalize and custom to the Texas theme. I also included “next steps” on the back of the invite which I printed on white stock paper, cut down to size and secured with the Washi tape. I’m no graphic artist but I really love the way they turned out!